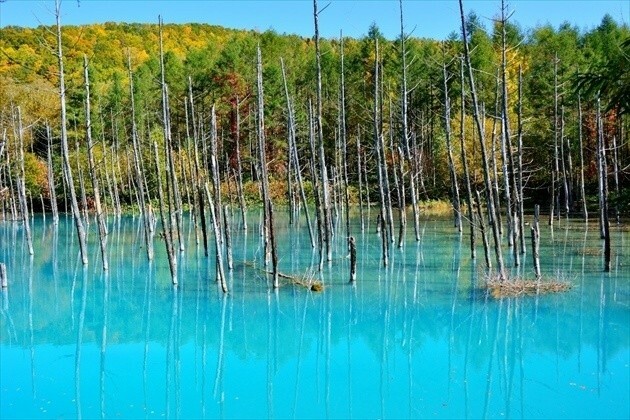 The Blue Pond in Biei, Hokkaido has become a hot tourist spot in recent years. 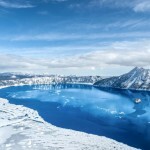 In this article, I am going to let you in on how the pond got its blue color, the best time to visit it, times when it becomes crowded and when visitors are relatively sparse, and about the allure of the Blue Pond itself. Even a slight breeze will change the pond’s appearance. When there is no wind at all, the pond looks as if it were an enormous mirror laid out on the ground. The Blue Pond is only one part of a harmonious symphony. The other part is its surrounding forest. The water’s enigmatic color has also made the pond a popular spiritual place. *This video was recorded in early July in 2015 with an iPhone 5S. 2. Why is the Blue Pond … well, blue? In 1988, nearby Mt. Tokachi erupted. To prevent the destructive effect of volcanic mudflow on the town of Biei, a dam was constructed on Biei River. 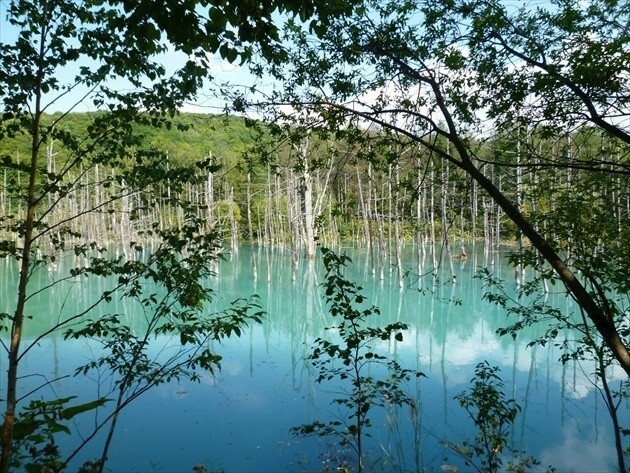 The Blue Lake is just one of a number of ponds that were artificially born as a by-product of said construction. Its birth is truly miraculous, however, as it takes several overlapping coincidences to attain the form that we see today. Here, Shirahige Falls stream down the cliff face into Biei River. Mt. 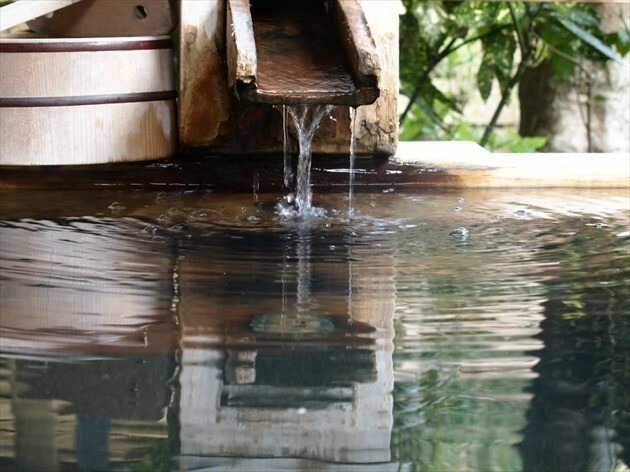 Tokachi, where the waters of Shirogane Hot Springs is sourced from, absorbs some of the water it catches down to become ground water over time. 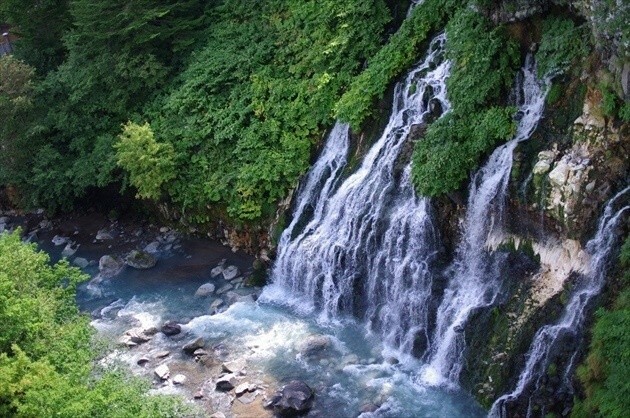 Then, it is mixed with the aluminum from the cliff during its very brief time as Shirahige Falls and into the river it goes. This is the secret of the pond’s blueness. But that is not the whole story. 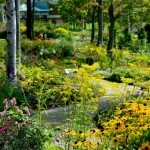 Other substances like sulfur and components of lime also make their way into the pond, whitening the rocks at the bottom. And thus the artificially-made Blue Pond gains its blue shimmer. However, the stunning scenery is not complete without a special essence not found anywhere else in the world: the trees in the pond. The once-living Japanese larch and silver birch trees in the pond quickly became partly submerged, with only their withered appearance remaining. In combination with the mysterious blue, the dead trees are a part of the scenery that is sad in some aspects, but ever beautiful. Such coincidences led to the creation of the Blue Pond’s superb vistas. 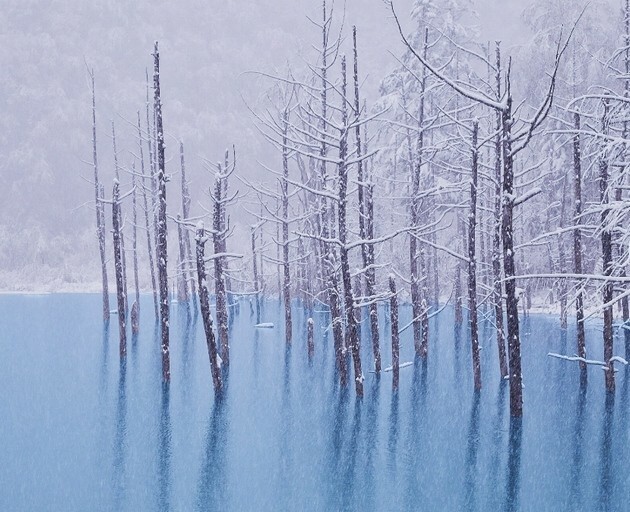 Its grace was unknown to the world for some time until one day a photographer from the neighboring town of Kamifurano happened upon the pond and was enthralled by it, who then published his pictures of such captivating beauty. 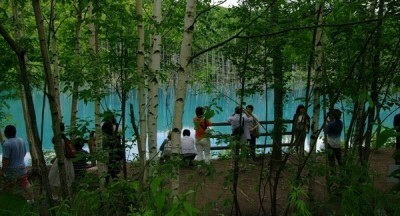 The Blue Pond immediately gained a reputation and photographers of all skill levels visited it in droves. The dream-like appearance of the trees in the pond added to its christening as the Blue Pond not long after. After a long winter, the Blue Pond excitedly heralds the coming of spring when the snow starts to fade away. Even as this happens, mornings are still chilly and the pond is still sometimes frozen over. 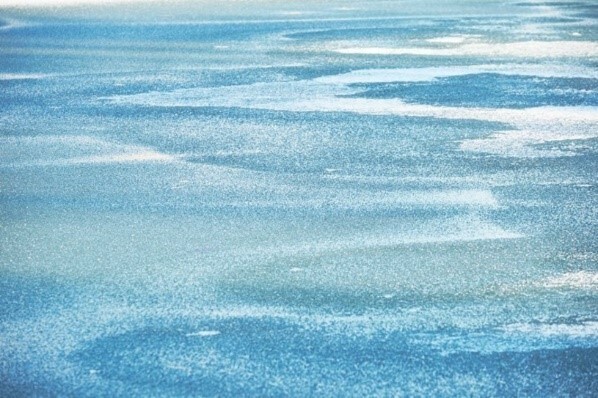 The frozen surface of the pond gives the appearance of white sand, and through its gaps observers can see the beautiful slightly contrasting blues. And amidst such an icy world, the forest signals spring’s arrival as it displays for the first time after winter its fresh young leaves. The Blue Pond becomes even more radiant when summer brings in brilliant days. While the pond is blue whenever you visit it, it is in summer when all the conditions for the pond to reveal itself in all its glory are fulfilled. 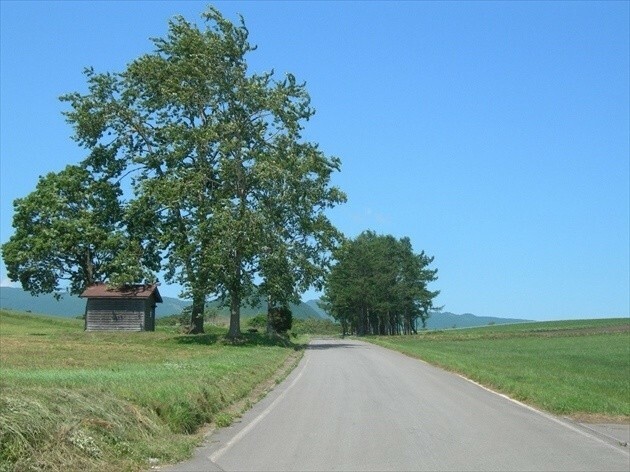 These conditions are: the absence of wind and rain, and a clear, bright day. The Blue Pond is a delicate feature of nature where even a slight breeze would disturb its surface enough to change its appearance, so when all the said conditions have been met, those present will have their breath utterly stolen away by its beauty. The first snowfall of the year at the base of Mt. Tokachi can be seen as early as October. Though the period where visitors can enjoy the sights of the autumn leaves is short, the reflection of the fiery reds, oranges, and yellows of the surrounding forest on the pond’s surface is truly a magnificent sight to behold. 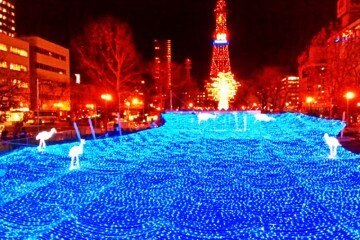 Though the Blue Pond was off-limits to the public during winter up until 2013, it began its tradition of being illuminated in winter since December 2014. The sight of the pond being completely covered in pure white snow and lit up adds to its alluring power that tempts you to visit this fairytale-like dreamscape. A view of the Blue Pond during the first snowfall of the year. The pond is frozen over at height of winter, allowing snow to pile up on top of it. 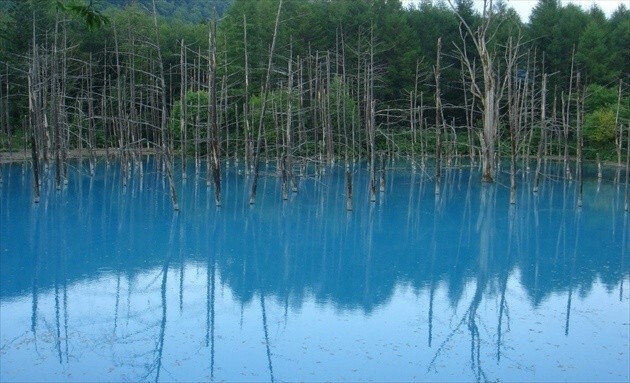 Let’s visit the Blue Pond! Here, I shall impart useful information for those wishing to pay a visit to the Blue Pond. 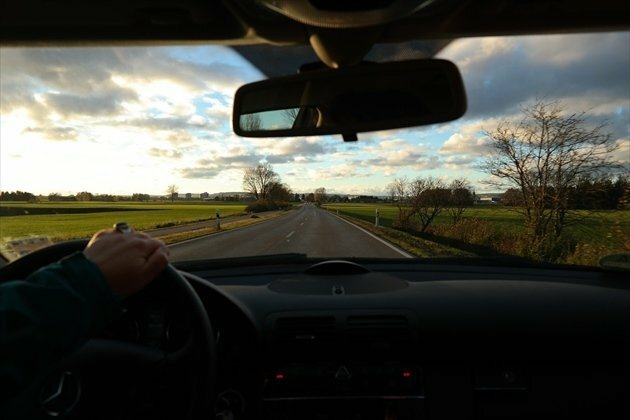 Prospective visitors are inclined to think about taking a rental car there (though using public transportation is, in fact, easier). But the with the rental car option, one cannot have total peace of mind. Plus, there are those who wish to visit alone but find the cost of renting a car for only one person a hard pill to swallow. For these types of visitors, I recommend taking a bus tour from Sapporo. 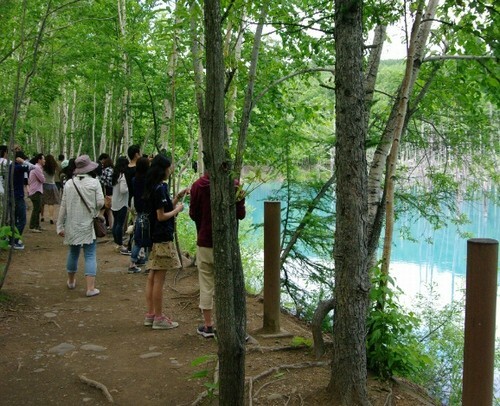 There are numerous tour agencies and bus companies that run tours to the Blue Pond from Sapporo, so please give this option your consideration. 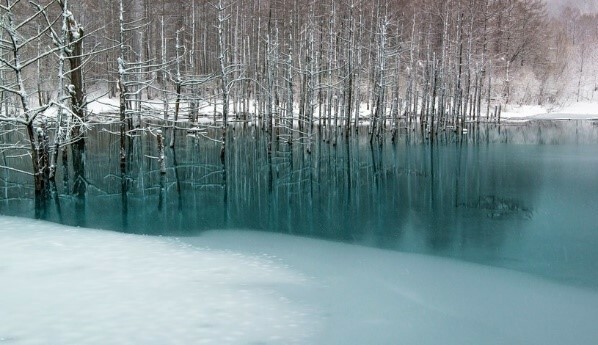 ・When is a good time to enjoy the beauty of the Blue Pond? 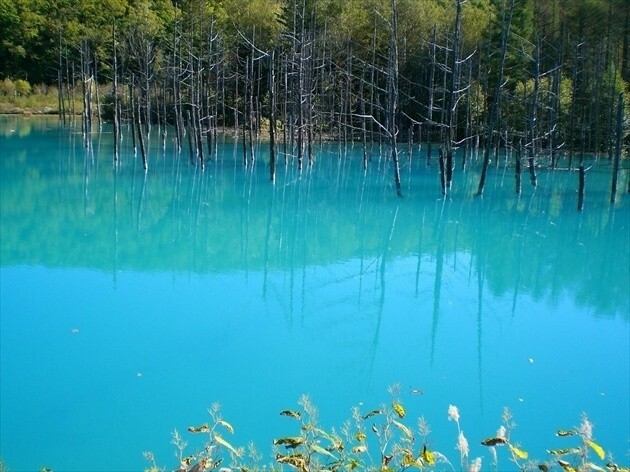 In a typical year, the Blue Pond conveys its most transparent and beautiful cobalt blue form from the middle of May through the end of June. 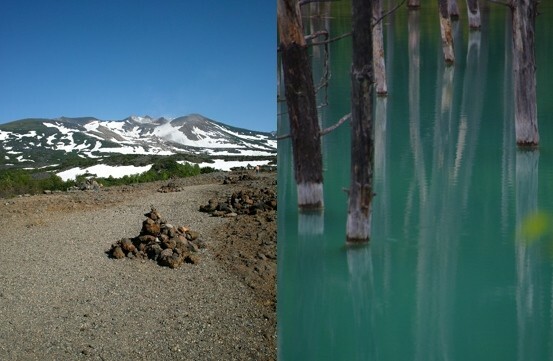 Outside of this short period, the pond turns into the color of emerald when water from melting snow and rainwater—water that does not contain aluminum—flows into it. The Blue Pond was closed during winter in the past. But, as previously noted, its wintertime illuminated vistas has been made available to the public since December 2014, so basically it can be enjoyed all year round. 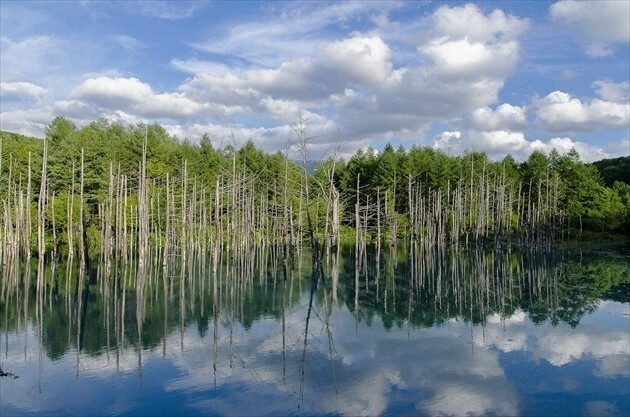 There are two main routes you can use when driving to the Blue Pond from Sapporo. 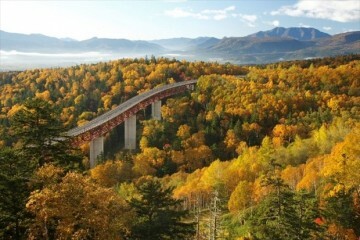 1: Get on the Hokkaido Expressway at the Sapporo interchange (IC) and get off at Mikasa IC, then go pass Katsurazawa Dam and through Furano (about 150km). 2: From Sapporo IC, get off at Asahikawa Takasu IC, and drive south towards Biei (about 180km). The shortest route is the first one. A smooth journey here will take around 2½ hours. 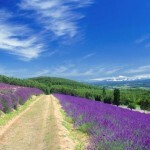 The route also passes through Furano, where you can enjoy its famous lavender fields as part of your journey. 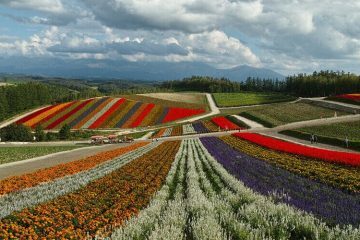 However, the traffic in and around Furano becomes congested in July and August, so you may want to avoid passing through it to save time. On the other hand, those opting for the second route could expect it to take around 3 hours. 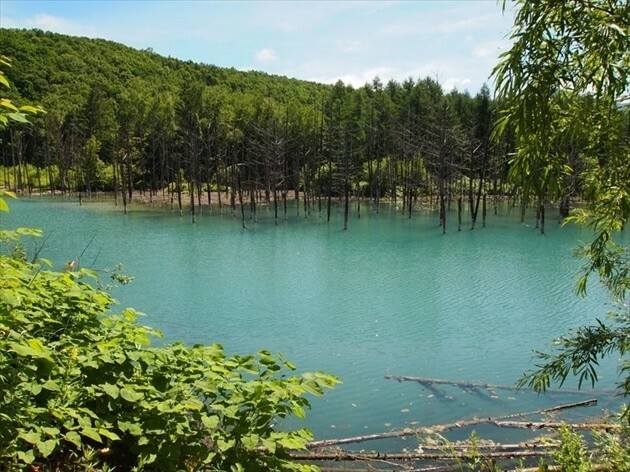 While it does amount to a detour, travelers on this route will not encounter terrible traffic congestion during the high season, so taking this route is recommended for those wishing to go straight to the Blue Pond. For those planning on renting a car at New Chitose Airport, use the Dōtō Expressway and get off at Shimukappu, then head north through Furano. The distance of this route is roughly 160km, translating to a driving time of about 3 hours. 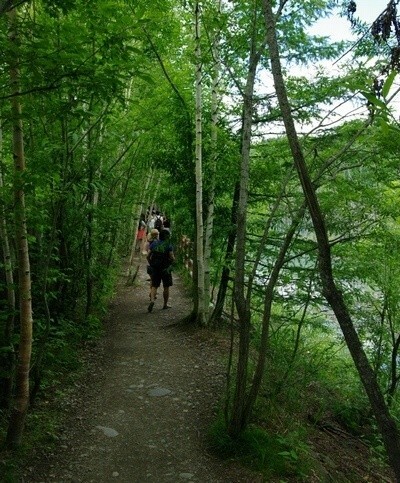 However, it may take longer during the high season due to traffic congestion in and around Furano. 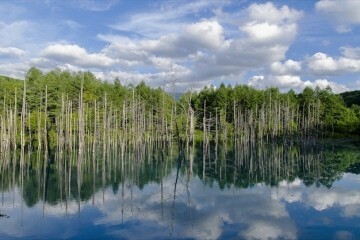 From Asahikawa, drive south towards Furano and go through Biei to reach the Blue Pond. From Asahikawa Station, it takes around 1 hour 10 minutes (about 45km), and from Asahikawa Airport, it takes roughly 40 minutes (about 30km). *It is possible to take a bus or taxi from Biei Station. There is a big parking lot of around 100 spaces for cars and 10 spaces for large buses. When entering the parking lot, the spaces immediately to your left are for buses, so car drivers should continue on further into the lot to park your car. For a detailed map, please go here to check it out. There is a signpost directing cars to the pond on the route from Biei to Shirogane Hot Springs for those driving along it. The Blue Pond’s parking lot. 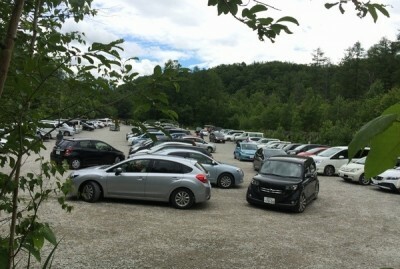 Although there are 100 spaces, waiting lines to park form during the high season. The pond is 500m from the parking lot, which means a walking time of 5 minutes. Those wishing to walk at a leisurely pace can expect a 10 minute stroll along the footpath. 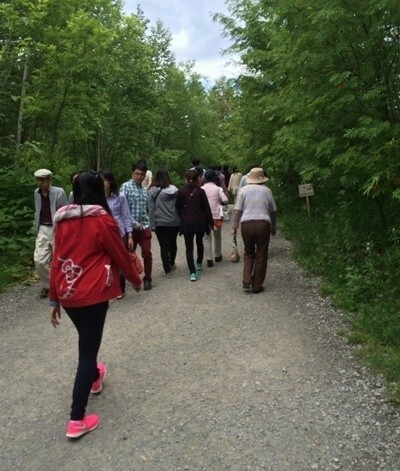 Due to the large amount of people coming and going during the high season, you may need to walk outside of the paved path, so please bring easy-to-walk-in shoes with you. Please note: As the promenade is very narrow, please take care not to bump into other pedestrians. Also, prohibited areas are roped off to prevent entry. Please respect the place and do not attempt to enter such areas. A guideboard of the Blue Pond at its parking lot. About 2 minutes in from the car park is this gravel path. Which soon leads to this narrow path covered by the shade of the trees beside it. The Blue Pond will gradually come into view on your right-hand side. Just 1-2 minutes on the narrow tree shade path will finally bring you to the Blue Pond. 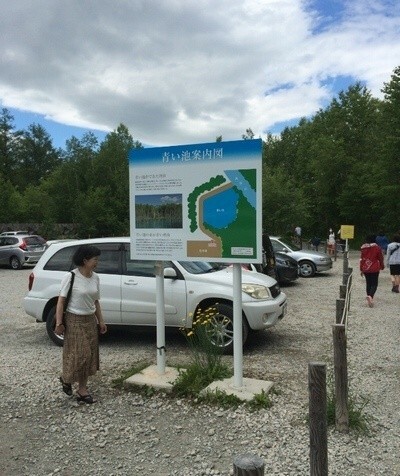 The period from June through August is considered the high season as tons of people come to see the lavenders of Furano and enjoy the hills of Biei along with the Blue Pond. 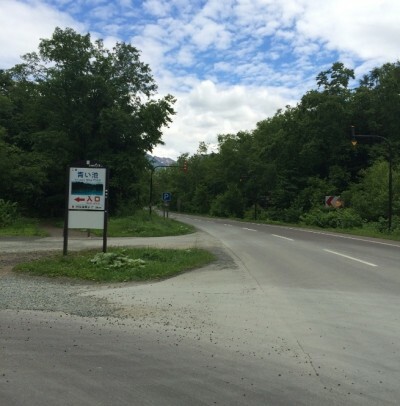 Cars heading northbound through Furano on Route 38 may encounter horrendous traffic congestion—to the extent where traffic struggles to move at all—from the intersection with Route 237 all the way to Biei. Please be aware that the congestion is especially bad on the weekends. In Biei, there are guest houses, pensions, hot spring inns and other types of accommodation, each with their own unique flavor. Those lodging in Biei have the benefit of enjoying the early morning view of the Blue Pond. 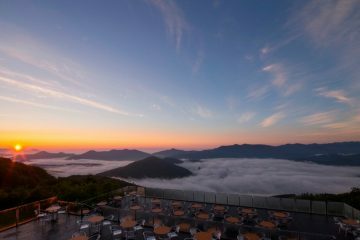 Because it draws such huge crowds, the sparse number of people present before 9 a.m. means that one can have a relaxing time appreciating its sights.